2Department of Medical Biochemistry, Kannur University, Kannur, Kerala, India. Received 15 July 2011; revised 24 August 2011; accepted 5 September 2011. Virgin coconut oil (VCO) has been shown to possess insulinotropic effects shown in isolated perfused mouse islet with hypolipidemic effects. Hot extracted virgin coconut oil (HEVCO) has been shown to possess better antioxidant properties than cold extracted virgin coconut oil (CEVCO). These properties were exploited to study the anti-diabetic effects of HEVCO and CEVCO in diabetic rats. 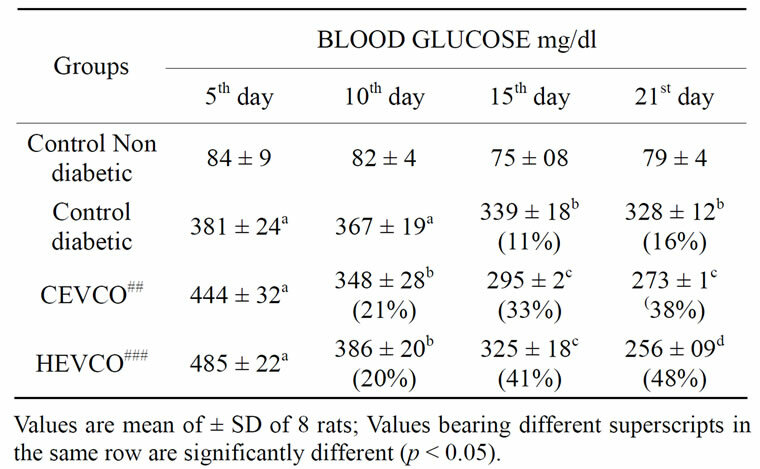 Four groups 8 rats each, first group served as non-diabetic control remaining groups were made diabetic and force fed with 2 ml alcoholic extracts of commercial coconut oil (CCO), CEVCO and HEVCO for 21 days. Blood glucose once in 5 days, body weight gain, food intake once in a week and water intake and urine output daily, were monitored. Animals were sacrificed at the end of 21 days. The results indicated HEVCO reduced blood glucose and lipids viz total cholesterol (TC), triglycerides (TG), Low and Very Low Density Lipoprotein (LDL + VLDL) and thiobarbutyric acid reactive substances (TBARS) increased the antioxidant status by elevating activities of antioxidant enzymes such as superoxide dismutase (SOD), catalase, glutathione peroxidase (GSHPx), glutathione (GSH) concentration and decreased lipid peroxidation in liver than CEVCO. These beneficial effects may be attributed to increased polyphenolic and other antioxidants content present in HEVCO. Diabetes a metabolic disorder is spreading like an epidemic disease and India appears to be the capital. Major causes of diabetes are consider to be, imbalanced food habits, change in life style, obesity, lack of physical activity, uncontrolled oxidative stress, genetic defects etc. Coconut oil is one of the primary sources of energy, in tropical countries like costal India, Srilanka, Philippines, and Indonesia . The oil holds high place of respect in ayurvedic medicine in India. Virgin coconut oil (VCO) a preparation of coconut oil without harsh processing such as refining, hydrogenation, deodorization, bleaching etc may retain native bioactive compounds present in it . VCO extracted in cold and hot conditions shown to be rich in polyphenols. Lauric acid, present in coconut oil has been shown to possess insulino tropic properties in isolated perfused mouse islet model but not proven in diabetic animals . It has been shown that hot extracted virgin coconut oil (HEVCO) possess better antioxidant potency than cold extracted virgin coconut oil (CEVCO) [4,5]. These two oils have been shown to inhibit lipoprotein oxidation with hypolipidemic effects . In diabetic patients antioxidants may play a vital role in improving insulin response to the loaded glucose and may reduce insulin resistance . However information regarding the anti-diabetic effects of CEVCO and HEVCO with their insulino tropic and hypolipidemic properties is not reported in animal model to the best of our knowledge. Hence experiments were carried out to study the anti-diabetic effects of CEVCO and HEVCO in streptozotosin induced diabetic rats. CEVCO and HEVCO were prepared according to the described method . CEVCO: Matured coconut milk was prepared by hand pressing the scraped coconut flesh and squeezed through multi folded mull cloth. The milk was chilled to 283˚K for 10h to solidify the oil. The aqueous layer was discarded and the oil was allowed to stand at 303˚K until it dissolved completely. The mixture was further centrifuged and the oil layer was separated. HEVCO: Coconut milk emulsion was heated to 373 - 393˚K for 60 minutes until water in the emulsion was completely evaporated. Commercial coconut oil (CCO) CEVCO and HEVCO were extracted thrice with methanol (1:4 V: V) and evaporated over a flash evaporator. Polyphenols , DPPH radical scavenging activity  and Fatty acid composition  were determined in HEVCO, CEVCO and CCO. Animal experiment was carried out as per guidelines of Institutional Animal Ethics Committee. 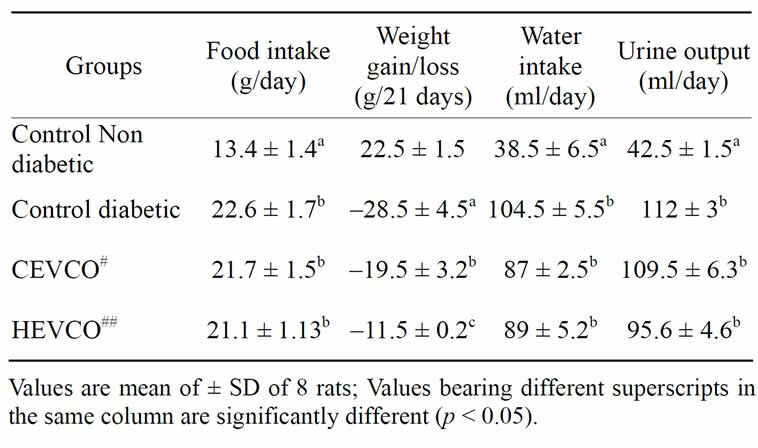 32 male Wistar albino rats reared at Defence Food Research Laboratory, Mysore, India, with body wt 140 - 150 g were selected based on uniform food intake and weight gain were maintained with standard laboratory conditions. 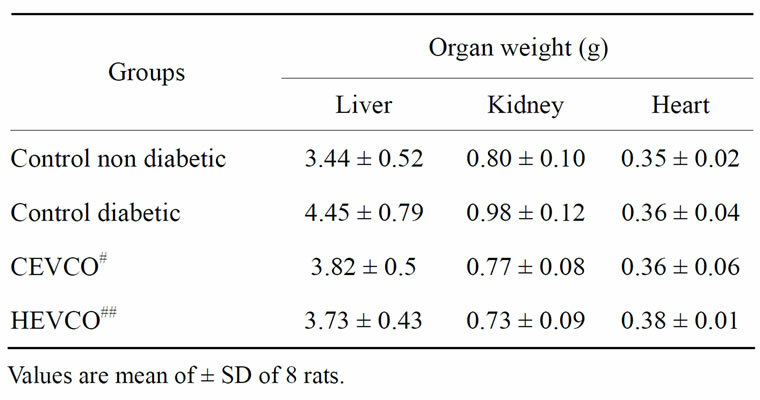 The animals were divided into 4 groups of 8 rats, the first group being non-diabetic control. Remaining 3 groups were made diabetic by injecting streptozotocin in biological saline intraperitoneally (55 mg/kg body wt.). Second, the diabetic control group was force fed with 2 ml extract of CCO. Third and fourth groups were force fed with 2 ml CEVCO and HEVCO extracts per rat per day after fasting from 9 AM to11AM. The animals were fed adlibitum with synthetic diet (Table 1). The experimental duration was for three weeks. Food intake and body wt gain were monitored weekly while, water intake and urine output daily. The blood glucose levels were monitored 5 days once, by obtaining blood samples from tail vain, after overnight fasting, with standard kit purchased from M/s Krest Biochemical’s, Bombay, India. At the end, animals were sacrificed, after overnight fasting, by survical dislocation. Blood samples were collected directly from heart, an aliquot was transferred into heparinized centrifuge tube to obtain plasma (centrifuged at 1000 rpm for 5 min) and analyzed for glucose, urea, creatinine total cholesterol (TC) triglycerides (TG) and high density lipoprotein (HDL)) with standard kits marketed by M/s Krest Biochemicals, Bombay, India. Table 1. Composition of the diet. Low density lipoprotein + very low density lipoprotein (LDL + VLDL) content was calculated by subtracting high density lipoprotein (HDL) cholesterol from TC. Thiobarbutyric acid reactive substances (TBARS) were assayed in both blood and liver according to Ohkania et al.,  and Girroti et al. . Whole blood was analyzed for haemoglobin, total white and, red blood counts and plate let counts (Sysmex model KX-21 Trans Asia). The organs namely liver, kidney and heart were removed and weighed. Liver and kidney samples were analyzed for antioxidant enzymes such as Superoxide dismutase (SOD),  catalase , and glutathione peroxidase (GSH-Px)  and glutathione (GSH) . The data were subjected to ANOVA by “graph pad prism software” the results mentioned were significant at p < 0.05. 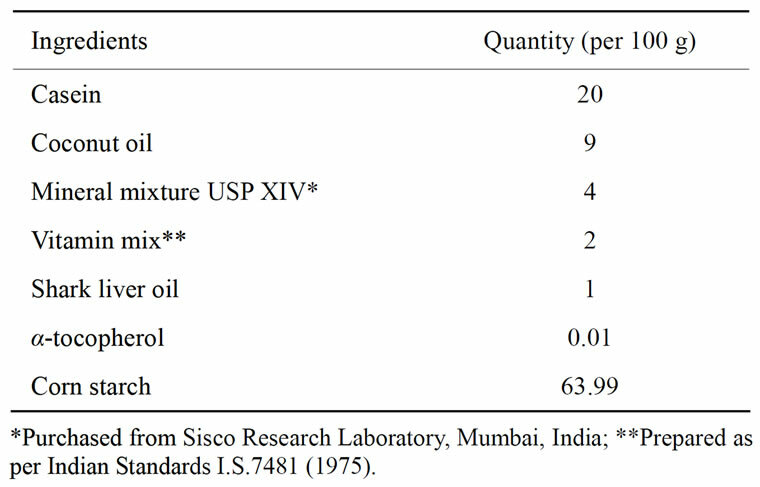 Polyphenolic and radical scavenging activity were high in HEVCO than CEVCO and CCO (Table 2, Figure 1). There was no change in the concentration of fatty acids in all the three oils namely CCO, CEVCO and HEVCO (Table 3). Figure 1. Free radical scavenging activity of coconut oils by DPPH assay. Increased food intake with body weight loss was observed in all the diabetic groups. Lowest weight loss was observed in HEVCO. Higher weight loss was observed in CCO group with no change in water intake urine output and liver, heart and kidney weights (Table 4). Gradual decrease in blood glucose was observed in all the 3 groups of animals. CCO extract was able to decrease the blood glucose from 381mg to 318 mg during 3 weeks (4%, 11% and 16% at the end of 1st, 2nd and 3rd week respectively). Significant decrease in CCO extract fed was observed at the end of 2nd week and remained unchanged up to 3rd week. In CEVCO group significant decrease from 1st and 2nd week was observed but with no change at the end of 3rd week. (The percent decreased was 21%, 33% and 39% at the end of 1st, 2nd and 3rd week respectively). HEVCO group decreased the blood glucose 21% (p < 0.05) 33% and 47% at the end of 1st, 2nd and 3rd week respectively Complete inhibition of lipid peroxidation was observed in HEVCO group but was marginal decrease (not significant) was observed in CE-VCO group and CCO (Tables 5 and 7). Table 3. Effect of different extracts of coconut oils on Food intake, body weight, water intake and urine output. Table 4. Effect of different extracts of different virgin coconut oils on organ weight. Diabetes increased TC and TG levels (70% and 25%) with respect to non diabetic control. The increased lipid levels were brought down to non diabetic control with HEVCO feeding. CEVCO and CCO had no significant effect. HDL levels remained unchanged. 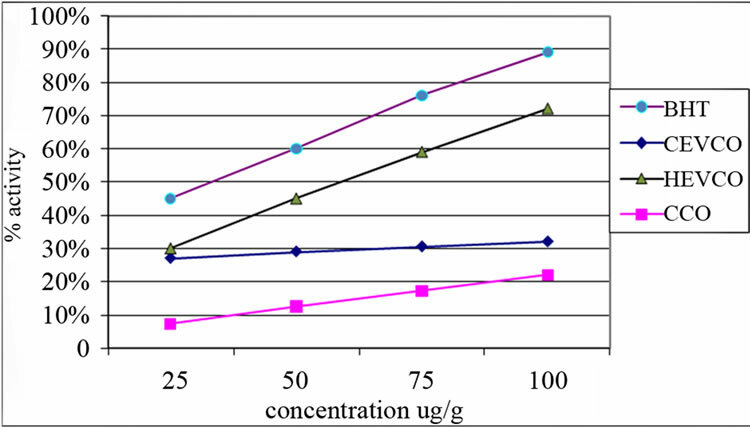 Significant increase in the concentration of urea was observed in diabetic group which was brought down to normal with HEVCO extract feeding (Table 7). Table 5. Effect of different extracts of different virgin coconut oils on plasma glucose. Table 6. 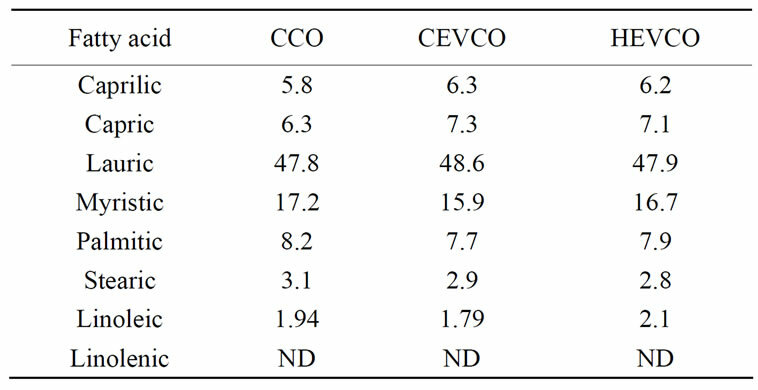 Fatty acid composition of CCO, CEVCO and HEVCO (%). extract (p < 0.05). The increase in lipid peroxidation (151%) was brought down to 64% and 27% with HEVCO and CEVCO (Table 8). The activities of catalase, SOD and GSH-Px decreased by 61%, 54% and 65% respectively in diabetic control. The decrease was only 23%, 43% and 17% in CEVCO and 17%, 45% and 3% in HEVCO group. Glutathione concentration was decrease by 38% in diabetic control group. Non diabetic control group and HEVCO group had same GSH concentration. Increased lipid peroxidation (69%) was brought down efficiently by HEVCO to 32 % (Table 9). 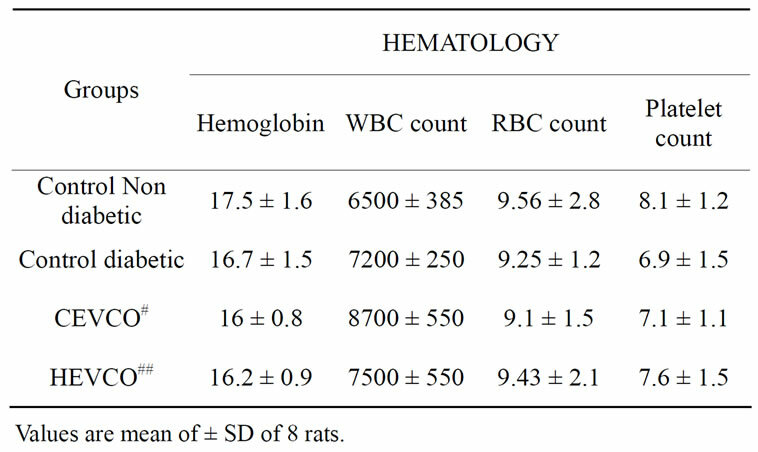 All haematological parameters remained unchanged in all the groups (Table 10). Diabetes, a silent killer, with many metabolic disorders is spreading like an epidemic disease. Anti-diabetic drugs for a longer period may have undesirable effects. In addition affordability for a common man on long run could be an economical burden and may affect the economy of both developed and underdeveloped countries. In this context natural anti-diabetic foods with least ill effects and low cost are most desirable. It has been reported that lauric acid in coconut oil has insulino tropic properties but reported in isolated islet of mouse . Kapila et al. have demonstrated HEVCO fed animals had better antioxidant status than CEVCO due to high polyphenolic (PP) content. Medium chain fatty acids and TG with these fatty acids metabolizes fast and may assist in preventing obesity and stimulate weight loss in diabetic obese patients . The fatty acid present may not be packaged into lipoprotein and do not circulate in the blood string which is true in vegetable fat. Antioxidant may enhance the sensitivity to insulin or otherwise may also reduce insulin resistance and injury to pancreatic beta cells by scavenging reactive oxygen species (ROS) in diabetic patients. These observations made us to exploit the advantages of CEVCO and HEVCO for their anti-diabetic effects. It is clear from the present study that HEVCO had better PP content and radical scavenging activity than CEVCO (Figure 1, Table 2), agrees very well reported literature . Increased PP content in HEVCO could be due to increased release of bounded PP with heat processing. The fatty acid composition remained unchanged in all the three oils (Table 6). In addition lauric acid with insulinotropic properties may have synergistic effects in combination with PP in reducing blood sugar . Better hypoglycemic effect was observed in HEVCO (47%) than CEVCO (39%) (p < 0.05) with same lauric acid content suggests the vital role of PP in protecting the pancreatic beta cells from apoptosis which is possible in diabetic condition due to enhanced formation of ROS. Better hypoglycemic effect of CEVCO than CCO could be due to available bioactive molecules retained by manual processing  (Table 5). The availability and concentration of these molecules may be more in HEVCO and CEVCO than CCO. However, CCO has also reduced blood glucose significantly could be due to lauric acid. Increased food intake, water intake and urine output are wellestablished diabetic symptoms, were not altered significantly. May be by increasing the quantity of extracts these complication could be prevented. However body weight loss was effectively prevented by HEVCO than CEVCO and was due to better hypoglycemic effect (Table 3). Table 7. Effect of different extracts of different virgin coconut oils on serum lipids and urea. Table 8. Effect of different extracts of different virgin coconut oils on liver antioxidants enzymes and lipid peroxidation. Table 9. Effect of different extracts of different virgin coconut oils on kidney antioxidants enzymes and lipid peroxidation. Table 10. Effect of different extracts of different virgin coconut oils on hematological parameters. Hyperlipidemia and elevated oxidative stress due to diabetes may lead to cardiac complications in diabetic patients. It has been reported that VCO reduces blood lipids even under normal condition . VCO rich in medium chain triglycerides metabolizes quickly thus accumulation of fat is inhibited [16,18]. In the present study TC, TG and LDL+VLDL level reached the control in HEVCO group whereas CEVCO reduced only LDL + VLDL levels. It has been shown antioxidants reduce TG  correlates well with the observations made in the present study since HEVCO had better PP content than CEVCO. It may also be possible that other vital antioxidant vitamins present in these oils due to no saponification may have role in reducing lipids . Antioxidants present in HEVCO, may also have a role in regulating cholesterol synthesis by regulating HMG CoA reductase activity. . CEVCO with lesser PP content has reduced marginally but not significantly both TC and TG. Lipid peroxidation in blood was also efficiently brought down by HEVCO and CEVCO. Decreased blood glucose, lipid peroxidation with hypolipidemic effects is desirable in diabetic patients. Urea and creatinine levels assess the kidney function. Creatinine levels did not show any change (data not presented) but urea levels in HEVCO group was similar to that of control non diabetic animals suggesting less disturbed protein catabolism (Table 7). SOD, catalase and GSH-Px constitute mutually supportive and defensive agents against reactive oxygen species (ROS). Decrease in the activity of these enzymes in liver may indicate increased production of free radicals. Activity of these enzymes particularly catalase and glutathione peroxidase reached the non-diabetic level with HEVCO and increased significantly with CEVCO. Hepatic lipid peroxidation was also effectively inhibited by both the extracts indicating better anti-diabetic effects of HEVCO and CEVCO (Table 8). Decreased activities of antioxidant enzymes in kidney were reversed with both the extracts. The activities of GSHPx the animal fed with HEVCO reached the control values suggesting better antioxidant properties (Table 9). A study conducted by Nevin et al. , has shown the VCO, compared with coconut and peanut oil in both in vitro and in vivo enhanced the activities of antioxidant enzymes and reduced lipid peroxidation in normal rats. In this study similar observations were made in diabetic animals may be attributed to quantity and bioavailability of antioxidant sin HEVCO. Thus the study has clearly demonstrated the anti-diabetic effects of VCO and HEVCO for the first time. The overall effect of HEVCO was better than CEVCO in enhancing the antioxidant status, reducing the blood glucose and lipid levels. The better health benefits of HEVCO may be attributed to its higher PP content and also possible increased bioavailability of nutrients. The authors are thankful to Dr. A. S. Bawa, Director, Defence Food Research Laboratory for his constant encouragement in carrying out this research. We would like to thank Mrs. S. Sukanya, for typing the manuscript. Hetono, T., Kagania, H., Yasuhara, T. and Okuda, T. (1988) Two new flavonoids and other constituents in licorice roots: Their relative astringency and radical scavenging effects. Chemical & Pharmaceutical Bulletin, 36, 2090- 2097.